The title of Navras Jaat Aafreedi’s lecture caught my eye: “Jewish Contributions to Indian Cinema.” It sounded like an academic variation on the old joke about “the elephant and the Jewish question” as if everything, no matter how far- fetched, has a Jewish connection. Only this was no joke. I spoke with Dr. Aafreedi by phone prior to his talk sponsored by the Judaic Studies Program and the Samuel Rosenthal Center for Judaic Studies at Case Western Reserve University. We touched on Indian cinema, the Jewish population of India, and perhaps most interesting of all, the attraction of the young Indian scholar to the subject of Jews. His doctoral thesis, now an e-book, is titled The Indian Jewry and the Self-Professed “Lost Tribes of Israel" in India. While it is written in English, he has published numerous papers on Jewish themes in Urdu, the common language of almost all South Asian Muslims, the largest Muslim population in the world. The Indian film industry, largest in the world today, produces 800 motion pictures annually. Knowing mostly of “Bollywood-style” films, I assumed that India was relatively new to the cinematic arts. Aafreedi quickly corrected my error. India, he noted, began making films roughly the same time as Hollywood, in the early years of the 20th century. Indian cinema “owes a deep debt of gratitude to Indian Jewry,” he explains, because most of its earliest female actors came from the country’s Jewish community. At that time, acting was considered “demeaning” to Muslim women. “Jewish women were the first to break the taboo.” Prior to that, as in Shakespeare’s time, slim young men took the female parts. Female actors in the early days of the Indian film industry came from the Baghdadi, one of the three distinct Jewish communities residing in India. Baghdadi, Aafreedi explains, is the “umbrella name” given to Jews from all over the Mideast who first settled in India in the 1830s. They’re newcomers on the block compared with the much larger B’nai or Bene Israel, who date from 175 B.C.E., when a shipwreck brought them to India. The smallest group is the Cochini, from Cochin, in the Indian state of Kerala. Not surprisingly, the Baghdadi are the most liberal of the three Jewish groups, explains Aafreedi. They were also the most Anglicized of the three, wishing to identify with British society, rulers of India until 1947. The Baghdadi adopted English as their mother tongue and never bothered to learn Hindi or any other Indian languages. When the talkies came to film, that ended their careers as actors! Because of their Anglicized ways, the Baghdadi also had a “strained relationship” with the Bene Israel; the latter, although very “Indianized,” were strict adherents of Judaism. Acting was not the only arena in which Indian Jews made a difference, maintains Aafreedi. The Father of Indian animation was Ezra Mir (b. Edwin Myers) of Calcutta. Mir was also responsible in various capacities for over 700 documentaries. India’s “foremost film journalist” was Bunny Rueben, who wrote for film magazines; he also produced a film. Rueben died just this year. Currently, says Aafreedi, not a single Jew is involved with Indian cinema, either as actor, writer or producer. I am intrigued that Aafreedi, whose mother taught Arabic culture and history at the local university and whose father is a poet and writer in the Urdu language, chose Jews for his area of study. Many Jewish and Muslim scholars, he adds, identify the Pashtun tribe, from whom Aafreedi’s family is descended, with Ephraim, one of the ten lost tribes of Israel. Despite his heritage and scholarly interest, Aafreedi only met a Jew for the first time when he was doing research for his doctoral dissertation. (Among India’s population of 1.1 billion today, there are only 5,300 Jews.) 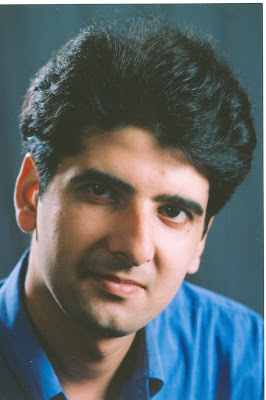 Aafreedi then did post-doctoral work at Tel Aviv University. At age 29, the handsome and voluble young scholar has many years ahead of him to accomplish his challenging and admirable goals. He recently spoke at the conference of the Midwest Jewish Studies Association conference and is lecturing in several American cities on his dissertation topic. After that, in the time-honored pursuit of all Ph.D.s everywhere, he is looking for a teaching job.